The term "sunroom" is an all-encompassing term that can be either mean screen room, three season room or a four season room; it could also be a solarium, which is a all season room with a glass roof. We create Better Living additional space for your outside enjoyment. When determining the type of enclosure, you need to determine the purpose of your addition. 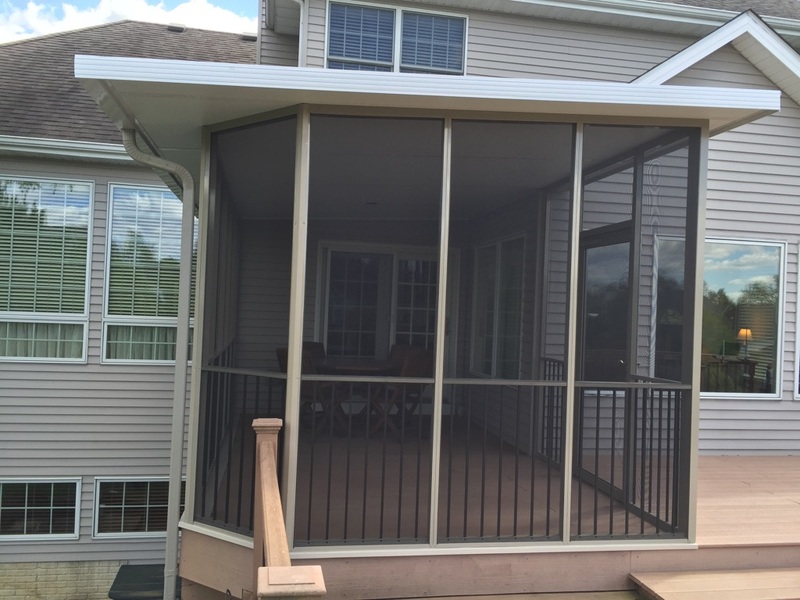 Screen Room or porch enclosure, room enclosure: This option has walls that are enclosed in screen rather than glass, which protects you from insects while still taking advantage of fresh air. A screen room is only habitable when the weather is agreeable and is a low budget choice. Our screen rooms are manufactured here. We manufacture aluminum extruded components to provide you with a maintenance free option. Aluminum doesn't twist or turn, it doesn't need to be painted or replaced after years of use. We create Better Living options for your outdoor space. Screen materials are available in different types, depending on usage, view and air flow, all are designed for insect protection. Bettervue screening gives you the best view and airflow option almost invisible to view. Our Tuff Screen option is excellent for a heavy duty type screen needed for pets. Solar Screen provides the least in air flow but provides shade option to your screen. 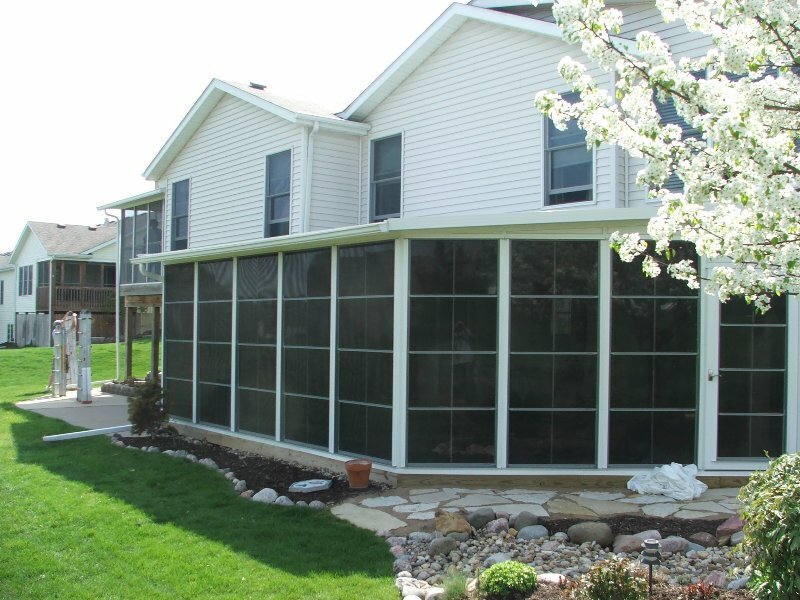 In our business, we see many types of homemade screen rooms. Wooden with screen stapled to wood to enclose. This option is maintenance type solution, frequently the staples can't hold the increment weather, the wood warps, twists and turns and needs to be painted or stained. Another option we have seen is enclosing a space with screen doors. 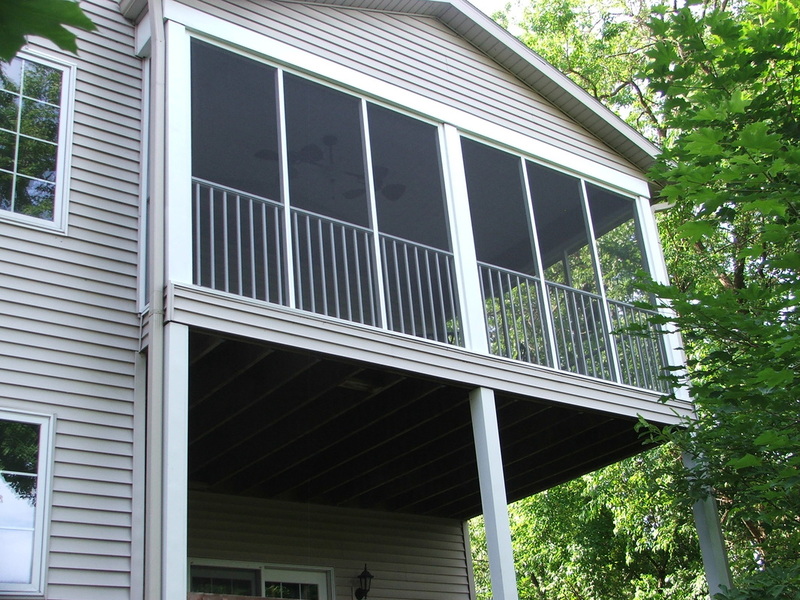 Screen doors are only available in certain sizes, thus making your sections smaller with more uprights and fillers are needed when the space does not fit and will need to be stained or painted to match the doors. This option again is a maintenance option. 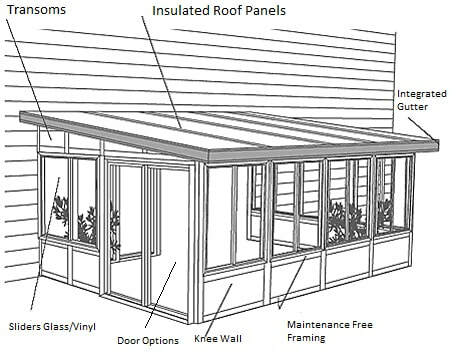 3 Season Room: A three season room is not insulated for winter weather, so in four season climates it will be too cold to use during winter months. It typically does not have its own central air-conditioning for summer weather either. Many customers heat and cool their room with portable units, or fans depending on their usage. 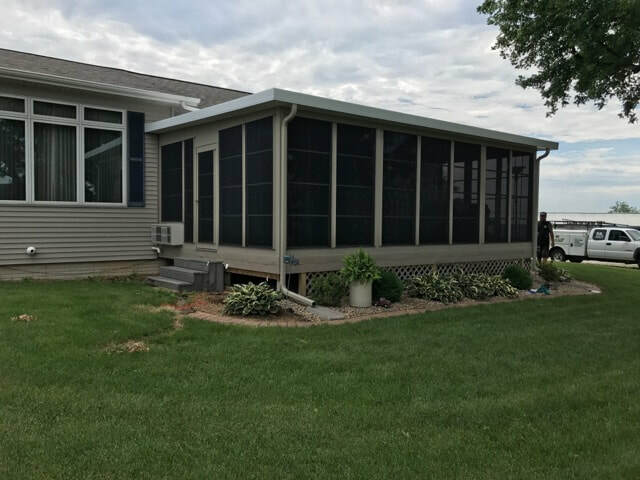 3 Season Enclosures extend the use of your screen room for additional season, no need to store your outdoor furniture, with 3 season enclosures, you can enclose a better living sunroom space til you are ready to use it. Glass or memory vinyl options available. Memory vinyl colors provides additional tints for shade as well as frame colors such as white, sandstone and bronze. Memory vinyl windows are custom made to fit your opening in 2, 3, or 4 track systems as well as horizontal sliders. Every product sold at DK can be upgraded from cover with patio cover, enclose with screen enclosure to Extend with 3 season windows. Budgeting for a project like this is determined by existing foundation and roof and starting new. We are a custom built company and each job has its own unique design based on your needs. All Season Sunroom. There are many questions concerning an all season room. 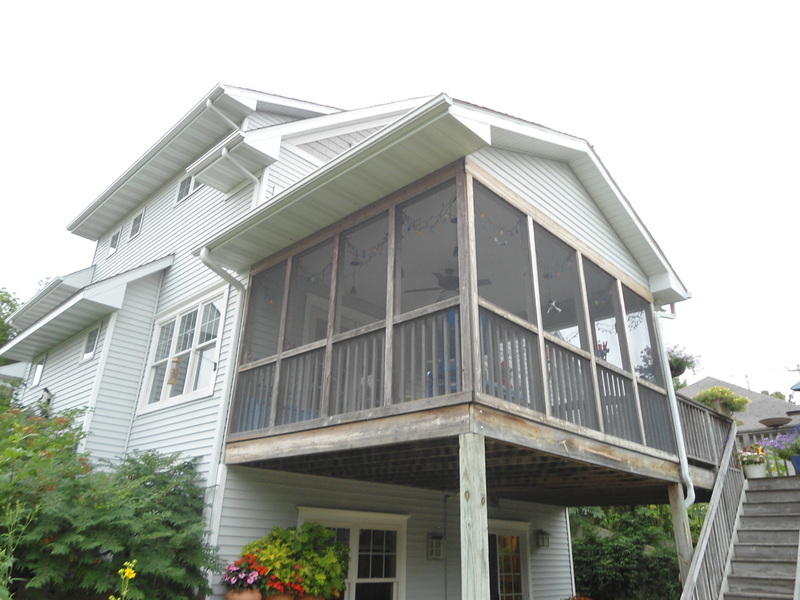 Is it a room addition or full functioning sunroom? We are asked that question everyday. There are many differences between the two options. ​Stick Built Room Addition Sunroom. 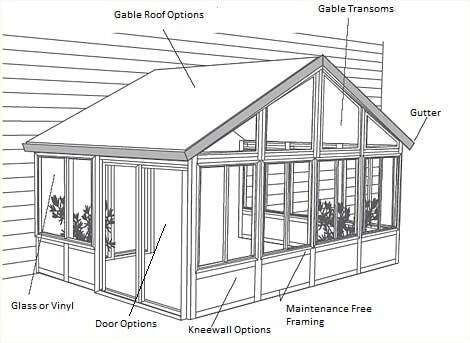 This type of sunroom is built on site: the foundation, the walls and roof are built, windows and doors are hung, and insulation, roofing and siding finish the building. Room additions use narrow, double hung windows with standard sizes which results in a considerable amount of fill material.